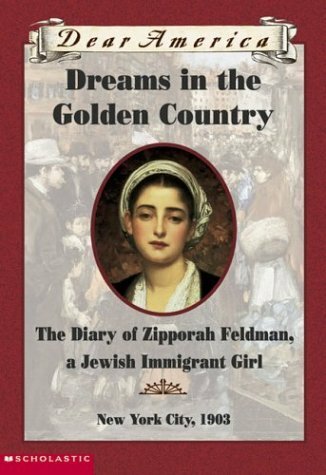 Dreams in the Golden Country: The Diary of Zipporah Feldman, a Jewish Immigrant Girl, New York City, 1903 by Kathryn Lasky. Scholastic Inc, 1998. Currently Available. Face Value: The interesting thing about these covers is that they really aren’t all that different from one another. But the design of them overall is so intentional and was so incredibly appealing to me when I was in middle school. From the attached ribbon to the cut pages to the fact that they were never released in paperback, they always felt so incredibly special. I love that this is an actual painting and I love the backdrop of the New York market. Does it Break the Slate? Totally. Zipporah demonstrates the classic Slatebreaker tendencies of being curious and determined, seeking out and valuing education and being passionate about something she fights to participate in (theatre in this case). And her older sisters provide Slatebreaking mentorship in different but both very important ways. Who would we give it to? Since we’re reviewing several books from this series this week its interesting to think about who we would recommend specific books to, as opposed to the series in general. Definitely I think that the series at large is terrific for middle grade readers who like historical fiction. They tend to be well written, thoughtfully constructed and compelling narratives that do a great job of capturing vital moments in history from a young woman’s point of view. As for Zipporah’s story in particular – I know it appealed to me as a kid, being a Jewish girl who loved theatre. And based on the demographic of people I went to college with I think I can safely say that represents a reasonably large audience. Review: This was my absolute favorite book in this series. It came out when I was in 8th grade, and a little too old for them in my mind, but it just fit so neatly into all of the things I liked reading about (New York City at the turn of the century! Jewish girls! Theatre!) that I read it about a million times anyway. And it totally held up to my adult reader’s sensibilities. The diary begins, as they all do, with some kind of inciting event that results in the protagonist receiving a diary and deciding to keep a record of her life. Often it is a birthday but in this case Zippy starts writing in her diary when she, her mother and her sisters arrive at Ellis Island to meet their father in New York. Once they arrive, they find New York City to be more challenging than the “golden country” they had envisioned, but it still provides wonderful opportunities for the Feldman family. Oldest daughter Tovah begins working with the unions, proud to have the opportunity to fight for her rights in America. Second daughter Miriam falls in love with a non-Jew. And Zipporah has the chance to go to school – where she thrives – and discovers the magic of the Yiddish theatre. The relationships demonstrated between the three sisters is well constructed, and we see them all find their way in America in different ways. Even though its definitely Zippy’s story, we get a real glimpse into all three of their characters and the ways they respond to their new life as American women. I particularly loved this moment between Zippy and Tovah, when Zippy is distraught and embarrassed at being placed in a class with six and seven year olds when she gets to school. And from that moment forward, school gets better. And by the end of the book, Zipporah catches up to her age group in school, knowing that all the possibilities of the world can be hers. It is, perhaps, too rosy a view of an immigrant’s life at the beginning of the 20th century, but it’s also an inspiring one. One weird thing I noticed in re-reading this book that I didn’t remember from previous – usually I thought these books were careful to root the stories in actual historical events. But instead of working at the Triangle Shirtwaist Factory, Zipporah’s friend Mamie works for the “Diamond” Factory, and is killed in a tragic fire there. I remembered the event, and just assumed it was Triangle. I was curious about this switch, as it seems much more powerful to use the historical content. Anyone know or have ideas as to why Lasky would make that choice? Overall though, this is a lovely piece of historical fiction, with dynamic characters and beautiful rendering of a moment in time. So glad to have read it again. Reviewed from copy purchased at Bookmans. This entry was posted in Middle Grade, Reviews, Theme Week and tagged Dear America, Historical Fiction, Immigrants, Judaism, New York City, Sisters, Theatre, Triangle Shirtwaist Factory. Bookmark the permalink.